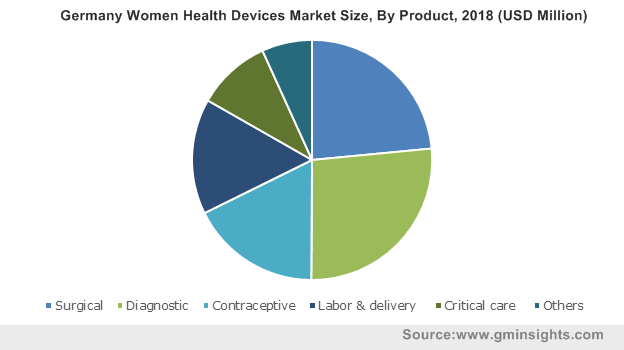 Women Health Devices Market size was valued at USD 27.1 billion in 2018 and is expected to witness 6.6% CAGR from 2019 to 2025. 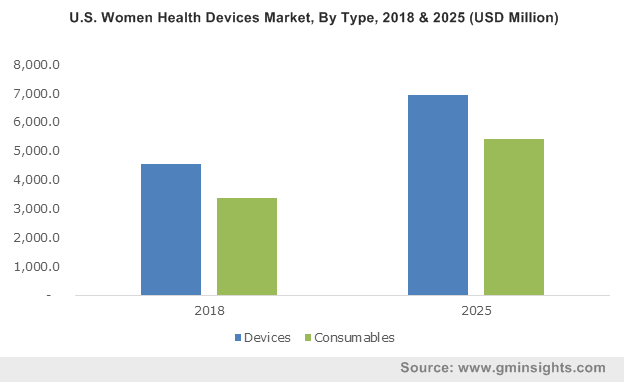 Growing incidence of chronic as well as infectious disease among female population will drive the women health devices market growth during the forecast period. According to the American Institute for Cancer Research, breast cancer is the most commonly occurring cancer among women, accounting for over 2 million new cases in 2018. Additionally, in 2019, around 268,600 new cases of invasive breast cancer are estimated in the U.S. women. Growing adoption of unhealthy diet and lifestyle changes will increase the disease burden thereby, augmenting the women health devices industry growth. Moreover, increasing prevalence of infectious disease among females in the underdeveloped economies due to unhygienic environment will favour business growth. Furthermore, technological advancement coupled with increasing demand for minimally invasive procedures will render positive impact on the business growth. Numerous efforts undertaken by government and other organizations to raise awareness regarding women’s health, management to reduce disease burden and promote availability of advanced technologies for diseases diagnosis and treatment will further drive industry growth. For instance, the Office on Women's Health (OWH) addresses critical women's health issues by educating patients and healthcare professionals, advancing policies as well as supporting innovative programs. However, high cost of devices along with lack of awareness among women especially in underdeveloped economies may impede women health devices industry growth to certain extent over the forecast timeframe. Devices segment held more than 55% revenue share in 2018 and is estimated to grow at significant rate by 2025. Advent of minimally invasive techniques has surged the demand for various surgical procedures among women. Patient inclination towards technologically advanced treatment procedures will foster segment growth in the foreseeable future. Consumables segment is poised to witness lucrative CAGR of more than 6.5% over the forecast period. Awareness among females in developing countries regarding women hygiene will favor business growth. Numerous initiatives such as menstrual hygiene camps to create awareness on adopting hygienic practices amongst women will further increase the adoption of consumables during the analysis timeline. Diagnostic segment accounted for over USD 7 billion in 2018 and is projected to hold significant revenue share by 2025. Increasing awareness among women about early disease diagnosis along with timely and effective treatment will boost the segment growth. Surge in demand for diagnostic devices such as doppler, probes, diaphragms, ultrasound, breast biopsy needles among others will spur revenue size during the forthcoming years. Contraceptive segment held considerable revenue share in 2018 and is estimated to witness 6.5% CAGR over the forecast period. Segment growth is attributable to high demand for contraceptive implants, intrauterine devices (IUD) and systems to prevent unwanted pregnancy. Growing preference towards these contraceptive devices over conventional pills will upsurge the segment size. Cancer application segment held momentous share in 2018 and will experience 7.0% CAGR over the forecast period. Rising demand for effective screening and self-examination for early detection of certain types of gynecologic cancers will drive segment growth. Increasing prevalence of breast cancer in developed as well as developing economies will thus, foster business growth over the coming years. Osteoporosis segment held more than 14% revenue share in 2018 and will witness similar trend over the coming years. Prevalence of osteoporosis is high among the females due to weaker bones as well as low bone density in comparison to males. According to the International Osteoporosis Foundation (IOF), 5.3 million individuals aged 50 years and above had osteoporosis in 2015, wherein 22.5% of them were women. Increasing prevalence of osteoporosis will surge the demand for effective treatment thereby, augmenting the business size. Hospitals segment was valued more than USD 8 billion in 2018 and will exhibit significant growth during the forthcoming years. Rising number of patient visits in hospital settings coupled with increasing number of surgical procedures will favor segment growth. Well-developed infrastructure and skilled personnel in the hospital settings will further augment the industry growth. Ambulatory surgical centers (ASCs) segment is anticipated to witness around 6.5% CAGR during the forecast period. Benefits offered by these centers including shorter patient stay, minimized risk of hospital-acquired infections (HAIs), cost-effective treatment and quality care will favour segment growth. Growing patient inclination towards ambulatory surgical centers coupled with rising technological development will further spur business revenue. 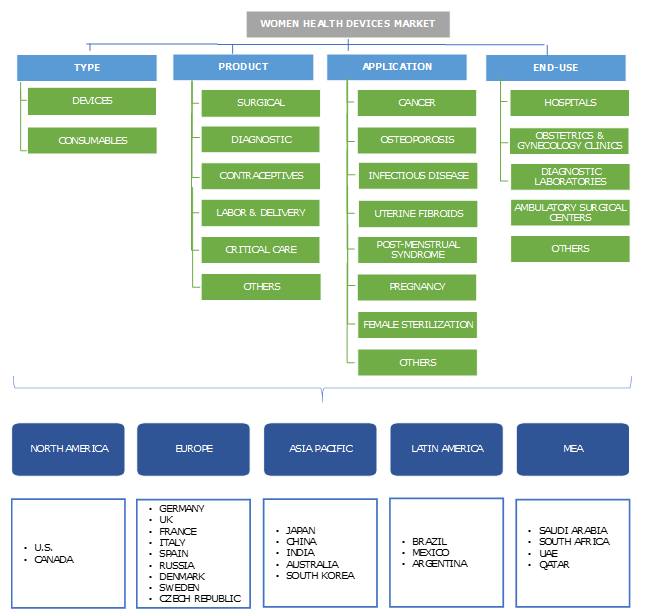 North America women health devices market held over 33% revenue share in 2018 owing to increasing awareness among women regarding their health and hygiene. Technological advancements in gynecological and orthopedic devices will surge its adoption in the region. Strong foothold of prominent industry players in the region, focusing on various strategies such as novel product launch will positively impact industry expansion. 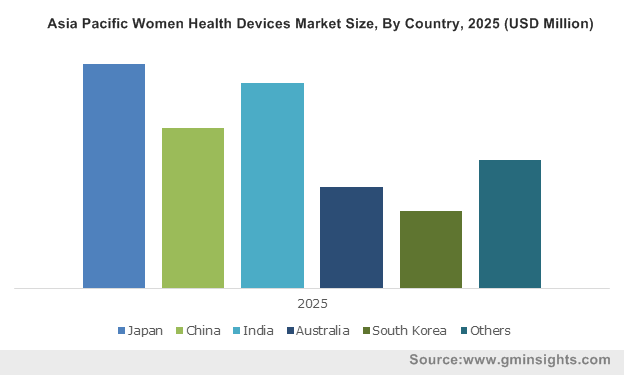 Asia Pacific women health devices market will witness lucrative CAGR of more than 7% during the forecast timeframe. Large patient pool in highly populated countries such as China and India, prone to various infectious and chronic diseases will act as primary driver in the regional business growth. Furthermore, growing awareness and favorable government support pertaining to women health will augment regional industry growth during the forthcoming years. Prominent industry players operating in the women health devices industry include Abbott Laboratories, Caldera Medical, Carestream Health, Cardinal Health, CooperSurgical, F. Hoffmann-La Roche, GE Healthcare, Hologic, Koninklijke Philips, MedGyn Products, Medline Industries, Prestige Consumer Healthcare and Siemens. Industry players are focusing their efforts on developing superior women health devices to enable minimally invasive procedures that are precise and cost-effective to cater to increasing consumer demand in developed as well developing countries. For instance, in November 2017, Hologic launched MyoSure, a manual device designed to enable easy resection and removal of intrauterine tissue in office settings. This new product launch helped company to strengthen its existing product portfolio and broaden its customer base. History of women health devices industry can be traced back in the 1960s and 1970s with the Women’s Health Movement (WHM) that primarily aimed at improving health care for all women. The 20th century further witnessed numerous and significant achievements in improving women’s health. Despite the narrow gender gap in life expectancy in industrialized countries, women experience more severe diseases with poor outcomes in many areas of health. Gender is an important social determinant of health, as women's health is not just influenced by their biology, but also by factors such as employment, poverty as well as family responsibilities. However, several initiatives undertaken by government and other organizations to increase awareness among women health and hygiene has altered scenario over the recent years. Advent of technology, awareness regarding early disease diagnosis and treatment on development and focus of industry players on development of innovative products will augment the women health devices industry growth over the forecast period.